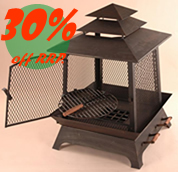 Buy the Vienna Cast iron Chiminea online: Largest range of Cast iron Chimineas UK online. Free delivery : mainland UK deliveries orders over £25. 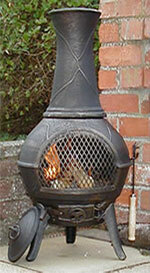 Our Vienna cast iron chimineas are great fun. Featuring a matching raincap, fire guard door and chimney spark arrestor. Finished in a superb premium quality heat resistant Bronzer colour paintl. The main reason to choose a cast iron chiminea over a clay one is that cast iron chimineas get hot and radiate a substantial amount of heat. They are also completely frost-proof so there's no need to move them indoors in the winter. 85cms Tall / 40 cms Diameter. Free Utility Tool worth £3.69 included. Our Deluxe Medium cover is suitable for the Phoenix, Vienna, Grapevine. Alacante, and Small Palma chimineas. Hardwearing 100% waterproof polyester fitted chiminea cover with elasticated bottom. UV stabilized. Please note, we will add £4.95 P&P for covers if ordered seperately. 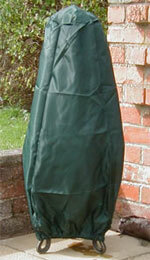 Medium Deluxe Cover £6.85 when ordered with a chiminea.